Costa Rica is the perfect place for a honeymoon, it has beautiful beaches, lush jungles, and plenty of adventures. It can be as adventurous or as luxurious as you want. What we love about Costa Rica is that it can feel so exotic, yet it’s still close to home for American Visitors. Here is our guide on how to plan the perfect honeymoon in Costa Rica. 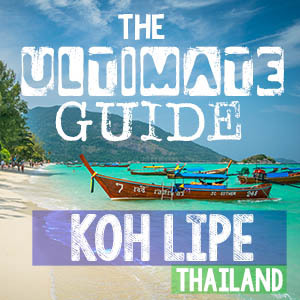 If you’d prefer to hand pick and plan your honeymoon the rest of the guide is for you. We’ve traveled all the way from the north to south on multiple trips to Costa Rica and assembled this guide to show you how to plan the perfect trip. There are two airports in the country and depending on where you are staying you can either fly into the central main airport SJO in San Jose, or the Libera airport services the North and Nicoya Peninsula. Renting a car in Costa Rica for your honeymoon is one of the best ways to get around especially if you want to visit multiple resorts. We’ve personally rented a car in Costa Rica on every visit and wouldn’t have it any other way. We truly believe the best way to see Costa Rica is by car. It gives you the ultimate freedom and will really make for a memorable honeymoon trip. Outside of San Jose, the roads are not very busy and generally easy to follow. If you choose to drive yourself a few things to know are that the rental prices are generally very low, but you are required by law to take insurance which will cost around $15 to $25 dollars per day. This is not negotiable even if you have insurance through a credit card or at home, it’s the law. Our car rental was literally $0 per day on Orbitz here, but after the third party insurance we ended up paying $210 for the week. We did have to present a letter from Chase stating we had collision damage waiver protection through our Chase Sapphire Rewards credit card. Call your credit card company in advance to get this document. You should also have a GPS or maps on your cell phone if you have data in Costa Rica.We have T-Mobile which covers us in Costa Rica. We also suggest picking up a local SIM card and data package at the airport, we suggest going with the company called Kolbi. If driving in Costa Rica isn’t your idea of fun there are plenty of options for transportation. For a honeymoon, we suggest hiring private drivers to take you between the destinations on your trip. It’s best to arrange this with a large reputable company or through your hotel directly. Also if you plan to take taxis for day trips or shorter trips make sure to use marked taxis which are insured and official. If you have pets at home we highly suggest Rover.com we found an amazing sitter who comes to our house daily to spend time with our cat and even spends the nights a few times a week. For more on Rover.com click here. The price of an average honeymoon really varies based on your travel style do you only stay in 5-star hotels and eat out 3 fancy meals a day OR are you open to 3-star hotels and eating out twice a day. The biggest cost factor will be your hotel and how luxurious of a hotel. There are some amazing hotels in Costa Rica and we suggest splurging for a few nights of luxury. The flight price will vary based on where you’re flying to and from and the time of year you purchase your tickets. On our last trip we booked our flights the week before and flew out of Milwaukee in September and we paid $550 a person. We didn’t think this was bad at all because Milwaukee isn’t the biggest airport and we booked last minute on our preferred airline Delta. The biggest expense on your honeymoon budget will be the hotel. There are hotels in Costa Rica for everyone’s budget. If you know you are going to be out exploring most of the day maybe consider a midrange hotel since you won’t be in the room that much. If you want a few days just relaxing at the hotel and not even leaving consider using these days for a luxurious hotel like the Peace Lodge. We only stayed here one night but wish we would have stayed 3 nights. Most hotels in Costa Rica include breakfast so you’ll be left on your own for lunch & dinner. Depending on what part of the country you’re in you’ll either have several options in various price ranges OR you’ll only have the hotel restaurant as an option (usually pricier). On average a sit down nice restaurant will be $50-75 for two people with a drink each. Local restaurants are much cheaper typically $20 for two people. If you like trying local restaurants and don’t need 3 meals a day your food prices will be cheaper. As we mentioned above, we highly suggest renting a car and driving yourself everywhere. On our last trip, we had a 4-wheel drive SUV for a week for $200. This price includes all the taxes, fees, and required Costa Rica car rental insurance. If you choose to hire private drivers the price will vary based on the distance and how many places you visit. You could easily spend more or less on things to do in Costa Rica it really depends on how active you want to be. Some people prefer to relax at the hotel instead and others would love whitewater rafting in Costa Rica or ziplining. The majority of honeymooners in Costa Rica spend a week to 10 days on their honeymoon, so we have based our guide to fit. If you have more or less time you could add or subtract a destination. However, we suggest to not visiting more than three destinations on a week-long trip. Packing/unpacking and moving hotels will cut into the time where you could be enjoying your honeymoon. If you want to see a lot of the country we suggest basing yourself somewhere central and taking day trips or tours rather than changing hotels every other night. Day 1 Arrive at San Jose Airport to La Paz, Costa Rica When you arrive into Costa Rica one of the best nearby destinations is La Paz only an hour away from the airport, but it feels like another planet. The quiet and peaceful gardens are the perfect place to kick off your honeymoon. This destination work especially well if you are arriving into the country later in the day. San Jose doesn’t have a lot to offer tourists and is best to get out right away or stay a night close to the airport if arriving very late. Alternatively, if you arrive early in the day you could go further and make La Paz your final stop on your honeymoon too. Either way, La Paz and the Peace Lodge should not be missed on any good Costa Rica Honeymoon Itinerary. We suggest at least 2 nights at the Peace Lodge in La Paz to enjoy everything this place offers. You may also visit the beautiful gardens if you don’t stay here, you can buy a day pass which gives you access to the park from 8 am to 4 pm for $44 per person. If you love waterfalls you shouldn’t miss La Paz waterfall. If you have time a day trip to Paos Volcano is a great way to spend an afternoon. This is best done in the dry season mid-November to April to have the best chance of seeing the volcano and the lake in the crater, it can often hide in the clouds. Nature & Beaches: If you are looking for some quintessential Costa Rica then head to Manuel Antonio. Home to one of the countries most famous national parks. Home to stunning scenery and cute capuchin monkeys, you can go wrong with a trip to Manuel Antonio. There are pros and cons of this area. It’s one of the top tourist areas which means lots of good accommodation options, but it can be rather busy. Surf & Nature: For those looking to escape the crowds, head to Puerto Viejo on the Caribbean coast. This low key beach town has a unique atmosphere and makes a great honeymoon option. Here you’ll have your choice of 5 very unique beaches to lay your towel. Behind the beaches are lush jungles with many boutique resorts mixed in between. Don’t miss the Cahuita National Park to get your nature fill while visiting this side of Costa Rica during your honeymoon. Surf & Beach: For a more adventurous surf inspired honeymoon make your way to Tamarindo. Located on the Nicoya Peninsula this beach town is one of the best-known surf spots in the country. Another advantage to ending your trip in Tamarindo is that the town has easy access to the country’s other major airport in Liberia. The Nicoya Penisula has a lot to offer nature lovers and there’s no shortage of day trips you could take while staying in Tamarindo. One of our top picks for honeymooners in Costa Rica is the mountain town of La Paz. It has most of the quintessential Costa Rican things all packed into one destination. The waterfalls and the gardens are the main draws here, but you also have lush jungle and cloud forests. To top it off you have excellent honeymoon level resorts and accommodation. Nestled under a blanket of clouds, Monteverde is the picture perfect jungle and cloud forest everyone imagines when dreaming about Costa Rica. The town itself has restaurants and nice accommodation options. Monteverde is a must on an adventurous Costa Rican honeymoon. Wake up with gorgeous views of the perfectly shaped Arenal Volcano. Spend the day relaxing in the natural hot springs right at many of the hotels or get your adrenaline pumping as you zip line 600+ feet above the rainforest. There are tons of hotels and restaurants for everyone’s budget and taste. A popular spot on the Pacific has some of the best beaches for surfing in Costa Rica. If you aren’ a surfer don’t worry there are still a ton of reasons to stay in Tamarindo. On Costa Rica’s Pacific cost sits Manuel Antonio National Park, which is 680+ hectares. There are gorgeous white sandy beaches, great snorkeling & surfing, tons of hiking trails, and rainforests full of animals & birds. It’s a great place for a few days of outdoor adventures. Only an hour away from Liberia airport is one of Costa Rica’s most popular shorelines. Gorgeous beaches, volcanoes, rainforest, diving, surfing, wildlife, and mountain ranges are all in the area. Here you’ll find some of the best honeymoon resorts in Costa Rica geared just for couples. A short drive south of Manuel Antonio is the cute little surf town of Dominical. If you’re looking for a quiet place to escape during your honeymoon with some waves, Dominical might be your place. Our favorite spot in Costa Rica is Puerto Viejo on the Caribbean side. If you’re looking for a chilled out spot and fun little beach town Puerto Viejo is it. Rent a beach cruiser bike and visit some of the best beaches in Costa Rica. 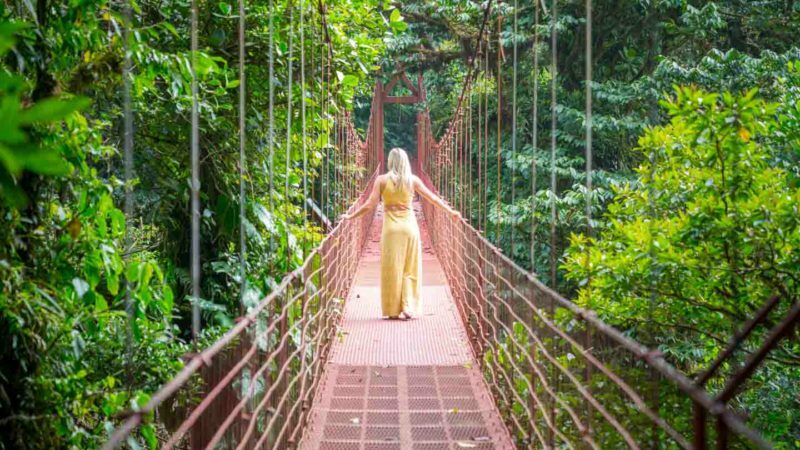 There are several hanging bridges in Monteverde, if you visit the Monteverde Cloud Forest Reserve the is one gorgeous hanging bridge. However, if you want to visit the famous Skywalk which is a 984-foot hanging bridge you’ll need to purchase tickets here. Tamarindo has some of the best surfing in Costa Rica. Pick up a board and catch a wave. For only $40 take a surfing lesson. Buckel on your helmet and get ready for a ride of a lifetime. One of the best zip lines in the world is in Arenal Costa Rica. Fly down zip line cables reaching speeds up to 60 mph and 656 feet above the ground. Make sure to book in advance here this one sells out, this is the one we’ve personally done. Every day you could explore a new beach in Puerto Viejo, and you should! We suggest renting a car or a bike to check out the best beaches in Puerto Viejo. Just outside the town of La Fortuna is the most beautiful waterfall in Costa Rica, La Fortuna waterfall. To get to this magnificent 230 foot cascading waterfall you’ll have to take the 500 steps down. We suggest going right when it opens to get photos with very few people in them. Purchase admission ticket here in advance. Only an hour away from San Jose is the most amazing waterfall. Walking around the La Paz Waterfall Gardens you’ll feel like you’re on the set of Jurassic Park. There are several day tours from San Jose, Jaco, click here for tours. If you’re staying at the Peace Lodge admission to the La Paz Waterfall Garden is included in your stay. Several hotels around Arenal have hot springs pool but The most famous hot springs in Costa Rica to visit at Tabacon Hot Springs and Baldi Springs. You can buy day passes here for $28. Several Arenal tours include a stop to a hot spring. There are some amazing day hikes in Arenal National Park. Make sure to go with a licensed tour guide that knows the area, for only $68 you’ll have an amazing view & workout. Recently named by Forbes magazine as one of the world’s most beautiful parks, Manuel Antonio National Park is a must when in Costa Rica. To ensure your chances of seeing wildlife join a Manuel Antonia National Park hiking tour for $55. The guides know exactly what to look & listen for in the rainforest. South of Manuel Antonio is the fun little surf town of Dominical. Over the years the town has seen a bump in tourism from adventure spun reality TV shows hosted on its shores. Dependable easy breaks keep surfers coming back to this little gem. If the weather looks clear on the way to or from San Jose head to the Poas Volcano. Often referred to as one of the world’s most accessible volcanoes. You can literally almost touch the rim of this active volcano. Another adrenaline-fueled activity in Costa Rica is to make your way through class 5 rapids in one of the country’s many raging rivers. One of the best places to go rafting is the Pacuare River. This is the rafting tour we went on and highly recommend it. Looking for more honeymoon destination? Check out our other guides to find your perfect honeymoon. What are your thoughts on travelling to Cost Rica in October or November for our Honeymoon? Vacation days are limited for us and so is the budget and know this time of year is cheaper. Do you think it will be sunny part of the time? I know its the rainy season but does that mean rain for a few hours a day with sun or rain could be the full week we are there? I know you cannot predict the weather but just want to know if we can expect some sun… god forbid there are no hurricanes! Hi Lola, November might be a good option for you, it is outside the heavy rainy season in Costa Rica, but still not the peak winter season. Generally, even during the main rainy season it only rains for part of the day, usually afternoons. November is pretty late for a Hurricane, while technically possible the chances are pretty low. Another great time we find to travel to Costa Rica and the Caribbean is early December. By then the weather is generally dry and prices are some of the lowest they get. Happy honeymoon planning, hope you have a great trip! We have a price breakdown in the article that should help answer your question. It will really depend on the hotel types you stay in and how many activities you plan on doing. We would estimate $2800-3500 for two people. Safe travels and have a great honeymoon in Costa Rica.